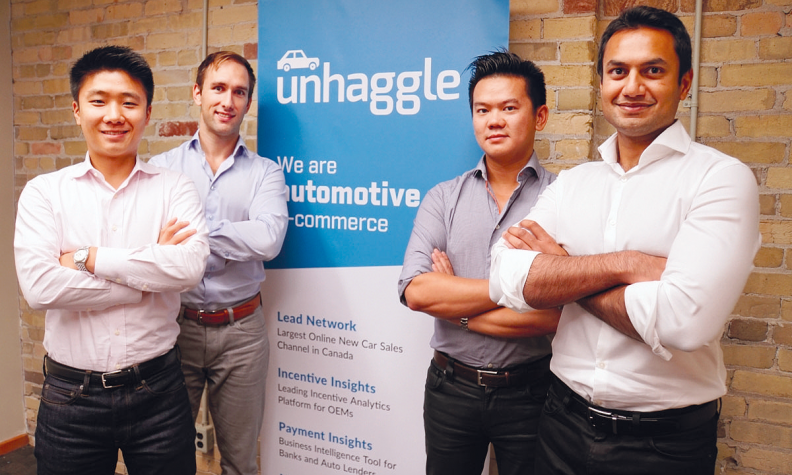 Childhood friends, founders and management team of Unhaggle.com, left to right, Andrew Tai, Radek Garbowski, Leslie Wong and Neal Shah. “We started Unhaggle.com based on personal experience shopping for cars and our belief that the industry was ripe for innovation,” says Andrew Tai, one of the four founders and its current CEO. As the company name implies, it was targeted at consumers who wanted to avoid the haggling portion of the car-buying process. It provides factory invoice price reports and it finds the lowest price offer by sending out requests on behalf of the consumer to Unhaggle’s network of dealerships. The Toronto-based company has grown far beyond the original vision, says Tai, adding that its namesake website at Unhaggle.com is now just one small part of the business. For example, Unhaggle is now in the process in launching its “next-generation” retail platform called MotoCommerce, which Tai says will enable an entire vehicle purchase without the customer leaving their computer. The company actually operates two different business segments: Consumer platforms; and Enterprise platforms, the latter recently rebranded to MotoInsight. Not bad for such a young company started by four childhood friends, who still remain friends.